With an electro galvanized, cold rolled, coil steel and aluminum enclosure, the 3TB Blackbox Pro 7200 rpm 3.1 Type-C External Hard Drive from Glyph Technologies is designed to protect your important data from the elements. Inside this rugged housing is a 3TB hard drive featuring USB 3.1 Type-C connectivity, making it simple to connect directly to Mac computers, as it comes preformatted HFS+. The drive is also compatible with Windows based computers; all that is needed is a quick reformat of the drive. Regardless of the operating system, the Blackbox Pro hard drive spins at 7200 rpm, supports a transfer rate of up to 220 MB/s to transfer even large files quickly and efficiently, and is also compatible with Thunderbolt 3 ports. For added peace of mind, Glyph offers limited 2-year level 1 data recovery, limited 1-year advanced replacement of the drive, and a limited 3-year hardware warranty. Included with the Blackbox Pro is a USB 3.1 Type-C to USB 3.1 Type-C cable, a USB 3.1 Type-C to USB 3.0/2.0 Type-A cable, and an external power adapter. 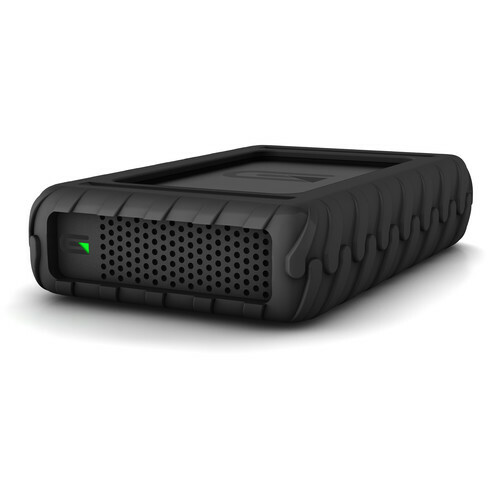 The Blackbox Pro is a tough, professional external hard drive that features USB 3.1 Type-C technology, a professional power supply, and optimized cooling. This drive also works with USB 3.0 and 2.0 connections, making the Blackbox Pro both future proof and backwards compatible. The Glyph Blackbox Pro comes prefomatted HFS+ with Journaling and is Time Machine compatible out of the box. With a simple reformat the Blackbox Pro can be used with computers running the Windows OS. Box Dimensions (LxWxH) 10.2 x 9.9 x 2.5"
Can you run this off of older usb connection, if you have an adapter? I've been using the 3TB model with a mid-2012 Macbook Pro with USB ports and works pretty well.